Dave, are you coming with us to the new gallery after work today? Oh no! I forgot about that, Abby. I’ll have to take a rain check. Could we go next week instead? Well, today’s the opening, so Tom and I will go anyway. But we’ll tell you if it’s worth it! In this context, to take a rain check means so much as „etwas auf ein andermal verschieben“, it’s just a much more idiomatic way of explaining it than the German equivalent! It used to be sold to spectators at a baseball game when rain or other bad weather stopped play completely, and allowed them to return on another night and watch another game. You might be surprised that the whole game was stopped because of a little rain, because soccer players and other athletes play in some pretty extreme weather. However, in baseball, the condition of the sandy diamond is very important for play. If it becomes too wet, players running could slip and injure themselves. Therefore, the risk of stopped play becomes very high when the weather is bad. Rain checks became popular in the beginning of the 20th century, mostly because they prevented stadium operators from losing income generated by ticket and food or drink sales during extended periods of bad weather. Nowadays, we use the phrase to take a rain check to postpone any plans that we’ve made but can’t attend. Also, don’t be surprised if you see more posts about idioms that have their roots in baseball over the next several weeks. April is the traditional beginning of the baseball season and the sport has given speakers of American English many idioms that are often used in a business setting. We’re standing in a German discount supermarket on the 31st of December. The store is full; the people have that special panicked look on their faces that you only see before a public holiday. Young men and boys are gathered under a large sign advertising fireworks and filling their bags to the brim with consumer explosives. The fireworks are selling like hotcakes (wie warme Semmel gehen). The metal bin underneath the fireworks sign is soon empty. This idiom has its roots in American English (AE) from the second half of the 19th century, when it was more commonplace to buy bake goods from a church bake sale than today. 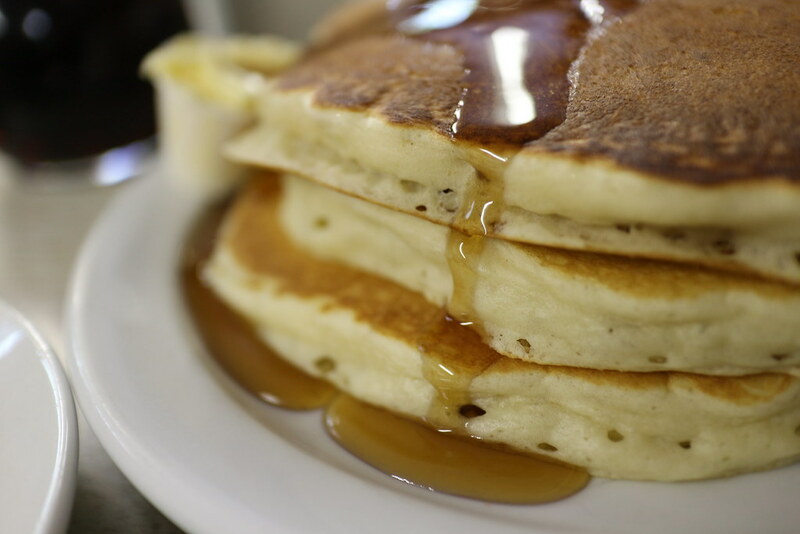 A hotcake is an older AE term for a pancake, and who doesn’t love a good stack of pancakes, especially when they are hot? The idiom also makes it clear that the seller doesn’t have to do much of anything to get rid of the goods once they are on sale- everyone wants to buy hotcakes while they are still hot. Also- for those of you who have only ever eaten the flat, European-style pancakes- here’s an easy recipe I like to use for fluffy, American-style „hotcakes.“ I substitute the baking powder for baking soda (Natron) in equal amounts. It would be perfect for one of those post- Christmas mornings when your whole family is at home for breakfast and very hungry. Enjoy, and happy holidays! My company is trying hard to save money. In one attempt to cut costs, we outsourced our IT department to an overseas service provider. But we have had to spend so much time explaining every little detail and dealing with language problems. In the end, it costs us as much as we saved by moving the IT staff off our payroll. It’s swings and roundabouts (gehupft wie gesprungen), really. This common British idiom comes from the longer phrase: „What you lose on the swings you gain on the roundabouts“ and is based on a poem by Irish writer Patrick Reginald Chalmers. It conjures the image of two fairground rides – the roundabout (similar to a carousel) and the swing. Both move without any actual change in location, they return to where they started. This image now stands for losses balanced by gains.